Currently I am waiting to breed my buck, Noah a Russian Blue Dumbo. I have been moving etc and things are just bananas. I am currently filling a waiting list for the babies. I have two females I haven't decided who I will breed him with. They both are very friendly and healthy but I'm being a bit fussy as I won't have any litters available until late September/October. If you are interested at all in a baby feel free to email me and I can put you on the list. Thanks so much for your interest. Hug your rattie today! 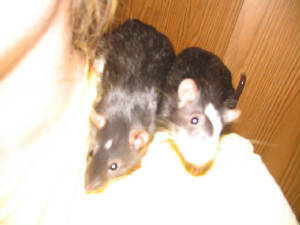 Sassy and Sophia were adopted to a loving home on February 5, 2006 to a very kind girl, Kim. I was so happy to have them adopted to a forever home yet if they were not that was fine too as they ALL have a place here in our rattie family. :o) I was also very sad to see them go. They were here longer than most and they became a part of our family and to see their personalities and little petite cuteness go was difficult. It is always that fear, will they be loved as much as they were with me syndrome. I know in my heart Kim will be a great mom to them. She keeps me updated with them as many of my adoptees do. and receive peanut butter as a treat occasionally. I've attached some pictures of them, I hope they get to you okay.